ABOUT: Vindaloo Curry is a very popular dish in many parts of India. When it appears on the menu, it's usually one of the hottest dishes served. Our seasoning isn't that intense, but it's most enjoyed by those who appreciate food with a little heat. 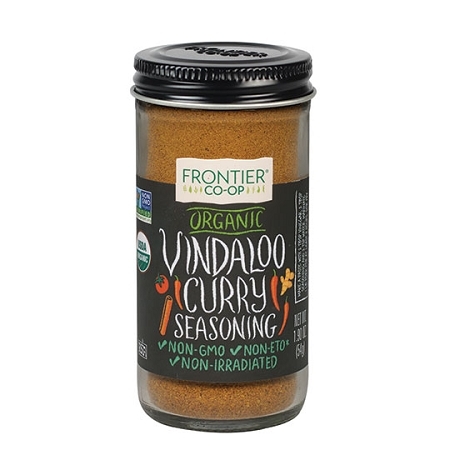 Frontier® Vindaloo Curry Seasoning is an organic blend of full-flavored spices for making authentic Indian Vindaloo curry dishes. METHOD OF USE: For a meat marinade, make a paste of 1 cup RAW Yogurt or Buttermilk, 4 Tbsp. seasoning for up to 1 whole bird, 4 leg quarters, 4 steaks, chops or breasts. Dilute with water if necessary to cover all the meat; marinade for at least 3 hours or up to a full work day in a covered container at room temperature on the counter or overnight. Bake, Broil, Grill or Cook as desired. You can definitely slow cook in a crock pot for an amazing result if you are making poultry. Add broth to chopped breasts or a little distilled water to bone in meat (do not cover meat completely- just 1/4 of the way to produce an incredible curry sauce to use over rice or veggies. ADD more water to make a curried soup!